Broadland Aerials are experts in aerial socket installations. 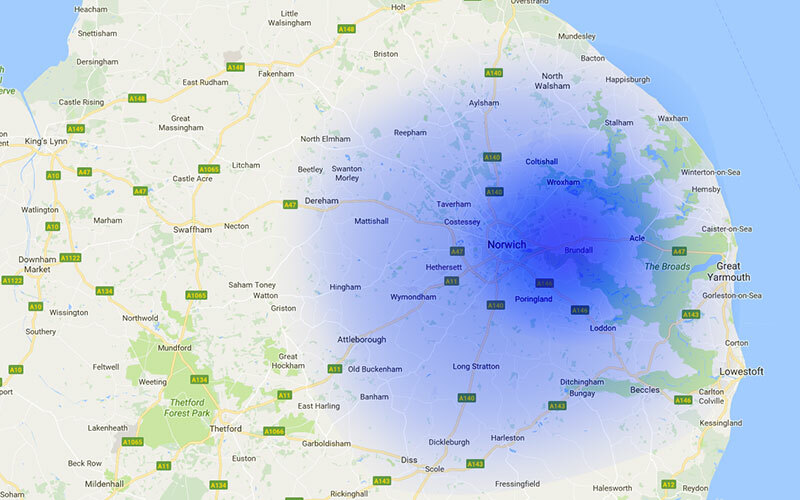 Broadland Aerials supply and install both TV aerials and satellite dishes for Freeview and Freesat in and around the Broadland and Norwich area. We are based near Norwich and we have built a great reputation by consistently offering our customers a first class, reliable, honest and good value service. Broadland Aerials are proud to be long standing members of Norfolk Trusted Trader. This is an initiative set up by Norfolk Trading Standards to help consumers make an informed choice right for them. Norwich - Thorpe - Sprowston - Aylsham - Stalham - North Walsham - Wymondham - Attleborough - Wroxham - Brundall - Cringleford - Blofield - Salhouse - South Walsham - Easton - Wicklewood. Please contact us on 01603 714797 to see if we cover your town/village. We provide aerial installation which is compatible with freeview equipment, allowing to you enjoy the best signal possible. We can aslo set up your freeview equipment. Our freesat satellite installation service includes discrete positioning of your satellite dish, whilst delivering the best signal to your freesat equipment. Whether you need a new aerial installation in your property, or replacement of a faulty aerial, our friendly team will install your aerial and ensure it’s ready to use. Our local aerial engineers will fit new aerial sockets into any room in your home, allowing you to enjoy TV across your home, business or showroom. Buy Local Norfolk is a not-for-profit ‘social enterprise’ which has developed a unique accreditation process for identifying businesses genuinely local to Norfolk. This is extremely important because truly local businesses keep a significantly higher proportion of money flowing within the local economy, thereby supporting local jobs, local distinctiveness and local communities in the most sustainable way possible. Broadland Aerials are proud to be long standing members of Norfolk Trusted Trader. This is an initiative set up by Norfolk Trading Standards to help consumers make the right choice.